The Deshon-Allyn House is located at 613 Williams Street in New London, Connecticut. It is situated to the southeast of the Lyman Allyn Museum, just north of Route 32. The home has features that recall both Federal and Greek Revival periods and it is likely the design was informed by the 1797 handbooks of Asher Benjamin. The home has a central floor plan with a symmetrical four room layout on the first and second levels with approximately 1600 square feet on each level. The façade is composed of mixed hewn granite block—often massive in size—quarried in Millstone. The mixed field-stone arrangement of the façade is complimented by finished granite quoined corners. The exterior has symmetrical fenestration on all facades except for the east façade, which has an offset entryway. The windows and doors are also accented with finished stone with heavy sills, lintels, and surrounds. The building has a central entryway, framed by engaged columns with vernacular fluted capitals in the Greek Revival Style. The central second-floor window directly above the door has a Palladian arrangement with similar elements—engaged columns, decorative latticework, lead caning—and the central window has an arch extending above the smaller flanking windows. The eaves of the roof shelter a carved cornice that is adorned with triglyphs and metopes. The hipped roof has two flush dormers at each side of the building. There are four equally spaced, flanking brick chimneys that provide ventilation for eight interior fireplaces—four of which persist from the original construction. The house was built by Daniel Deshon in 1829. Daniel had inherited the land, a working farm, and a frame structure from his father, Daniel Deshon. Daniel served as a whaling captain for a brief period between 1819 and 1824, retaining ownership in atleast two vessels thereafter. In 1829, Daniel Deshon built the granite residence for his wife Fanny Thurston. Fanny was the daughter of a well-known Rhode Island Senator, George Thurston, and supposedly Daniel began building the house after being encouraged to provide Fanny with a more stately home suitable for entertaining. Unfortunately, it was not long after the house was finished that Fanny passed away in 1833. Soon after her death, Daniel began to reside in Hartford, losing interest in the home and advertising it for sale in the Gazette as early as the following year. The property would not find a buyer for some time after. Eventually the property would be purchased by Lyman Allyn in 1851. Allyn was born just north of New London in Montville on April 25, 1797. Although his family would relocate to Springfield, Massachusetts, Allyn returned to Montville by the time he was twenty-one. He began to serve as a regular sailor serving under Captain Daniel Deshon and later as Captain for whaling vessels under the ownership of N. & W.W. Billings. By the time Allyn was thirty-seven, he retired from his seafaring duties and began to develop a variety of other business ventures and holdings. He was a board member of both Lyman Law and the Whaling Bank of New London throughout the 1830s and 1840s. He is also listed as a part of the board for the short-lived New London Marine Insurance Company between 1847 and 1849. After the merger of the Willimantic and Palmer Railroads, Lyman Allyn served as the director of the newly formed New London, Willimantic, and Palmer Railroad conglomerate. Allyn also served in the State Legislature, actively supporting the Democratic Party and was a member of the Episcopal Church. Lyman Allyn married Emma Turner, the daughter of Captain John Turner and Mary Beckwith. Together Lyman and Emma had six children, five of which survived into adulthood. They were: Mary, Emma, Charlotte, John, and—most importantly for the course of this history—Harriet Upson Allyn. Lyman Allyn passed away on April 8, 1874, just prior to his 75th birthday. His wife, Emma, died on February 4, 1881. Harriet was born on March 2, 1840. 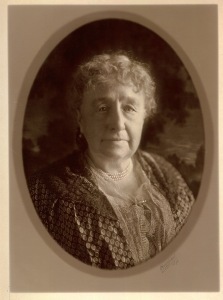 In 1889, Harriet Upson Allyn married a cousin, James Allyn, a successful Montville farmer and member of the Connecticut State Legislature. Harriet’s older brother John passed away in 1893, at which point Harriet asked her widowed sister-in-law to join her and live at the 613 Williams Street residence. Harriet’s marriage to James produced no children and he passed away in March 1898. Until Harriet’s health began to decline the in 1920s, she and Lucretia would travel broadly, frequently vacationing in New York and Florida. Harriet continued to retain ownership of the house until her death in 1927. The Deshon-Allyn House and its contents were left to Lucretia, but not for long. At the time of her death in 1931, all of the inheritance Lucretia retained from Harriet was entrusted to the Connecticut College for Women. 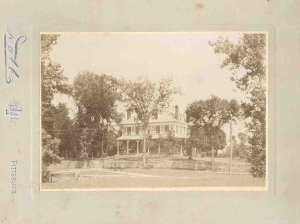 The house was then purchased by the Hartford-Connecticut Trust Company for the personal use and residence of the museum’s first director, Winslow Ames, and his wife, Anna. Ames and his wife resided in the home from 1932 until 1942. Following their departure, the house was rented for a short period to cadets attending the Coast Guard Academy. When the Lyman Allyn Museum regained the property in 1956 it was considered in “distressed condition.” At the time, Edgar Mayhew was serving as LAAM’s curator and it is his “subordinate determination” that created an exceptionally restored Federal Style showroom. Mayhew’s efforts placed the Deshon-Allyn House on the National Register of Historic Places in 1970. The Deshon-Allyn House is one of only twenty-five properties in the city of New London on the National Register of Historic Places. Edgar Mayhew’s enthusiasm was unrivaled and he would become the museum director; his living quarters were located on the second level of the house where he remained until he resigned in 1986. The house has been used sporadically between 1986 and 2014 for short periods, events, programs, and temporary office relocation. 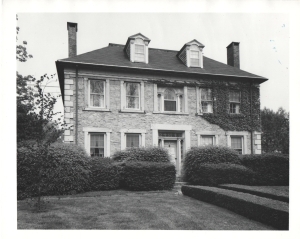 In 1991, work and expansion to the LAAM forced a temporary closure at which point offices were moved to the Deshon-Allyn house and docents gave tours of the first level to visitors. In 1994, the Connecticut foundation, Children and Families asked to use the house as a designer showcase during the summer for a joint fundraising campaign. In 1996, the “Best Room” was installed on the first floor by Frank Racette, decorated to reflect the style when the structure was built in 1829. In 1999, a generous endowment was given to install the “Fortune Galleries” in the south rooms of the first level. Recently, members of the Ocean Exploration Trust have established offices in the second level of the Deshon-Allyn House. Founded in 2008 by Dr. Robert Ballard, the trust has established international programs centered on scientific exploration of the seafloor. The relocation of the Ocean Exploration Trust Offices is an exciting, new chapter in the history of the Deshon-Allyn House.